What Constitutes a Real Taijiquan Class? Tai Chi as it is known in the West is really T’ai Chi Ch’uan AKA Taijiquan, pronounced Tie Jee Chewen. Today the various methods of Taijiquan are used primarily as an exercise to develop mind and body harmony and for the promotion of health and longevity. However while Taijiquan has a long history of creating glowing vitality in its practitioners it is also known as a soft or internal form of Chinese Boxing. This ancient art is in reality a health nourishing and soft style internal martial art system from China. A literal definition of the name Taijiquan is Great Ultimate Fist. This refers to both the martial art as well as the health method. Students of Taijiquan learn a series of postures linked in sequence to create a flowing exercise called a form but there is much more to the study of Taijiquan for health or self-defense than learning a form. Five Treasures Grand Ultimate Fist / Wu-bao Taijiquan or is a unique style of Taijiquan created by the Li family of Sichuan province China. It is based on the founding principles of the Taijiquan Classics written by the creators of the art. 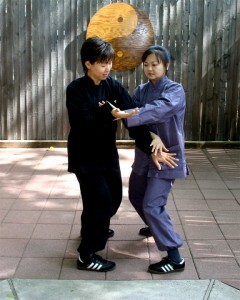 The Li family masters distilled the essence of two Taijiquan styles into a form with nine moves. There are four opening movements and five core movements; Void standing, open the ball, carry ball left, carry ball right, ward off, roll back, press and push. The simple movements provide all of the health and martial benefits that any style of Taijiquan has to offer. These nine moves are all that is needed to develop the health and martial promises of the Taijiquan arts. The short nature of this form makes it ideal for your busy life style. There are no long 100+ sequences to remember as in other long forms, just eight actions that can be repeated in an endless loop providing the ability for short, moderate or long workouts to fit your personal time schedule. Our Wu-bao Taijiquan course has three distinct levels so that anyone from 18-80 can study the art in a manner suiting their personal needs. You can learn the form only for health and stress relief in level one. After that if your interests run to self-defense aspects we can train you in the protective counter measures of Wu-bao Taijiquan with level two intermediate and level three advanced Taijiquan courses. Jiankang in Chinese means health practice. This first program focuses on using Taijiquan methods of Quiet Sitting, Power Standing and the Wu-bao Taijiquan forms for health only. Scientific research has shown daily practice of Li family Taijiquan to be capable of stimulating the central nervous system, lowering blood-pressure, relieving stress, enhancing vascular circulation, increasing joint flexibility, improving lymphatic circulation and gently toning muscles without strain or high impact on the joints. Level one can be taken as a stand alone program designed to impart the knowledge and skills needed to use Taijiquan for developing health and stress relief. 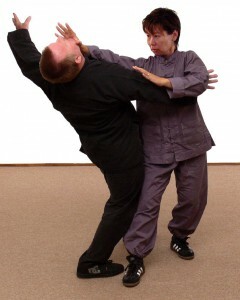 If you have no interest in the self-defense aspects of Taijiquan you need go no further in your studies, however this course is a required entry level program teaching the Li family Wu-bao Taijiquan form that will impart the core knowledge necessary for developing the skills presented in the two martial art courses. Tui-Shou means pushing hands and refers to special exercises designed to develop sensitivity and awareness in Taijiquan for martial ability. The student of Taijiquan is introduced to the soft style (internal) martial principles through a series of two person games and exercises known as Bending Willows and Pushing-Hands. These methods are designed to take the student slowly through the basic physical and philosophical concepts these games not only teach how to deflect and neutralize physical attacks but their principles can also be applied to developing persuasive conversational skills for dealing with tense emotional situations. In Chinese Zhandouli-fa means combat effective art. This level introduces the student to martial skills from the Wu-bao Taijiquan form for self-defense applications. Although known primarily as a health system in the West Taijiquan was one of the most famous and effective of all the martial art styles in China for hundreds of years. 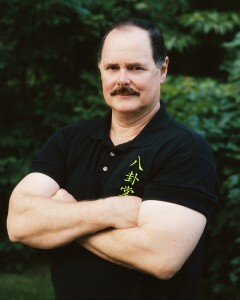 Dr. John Painter is one of only a handful of people alive today who truly has practical knowledge of Taijiquan as a method used for realistic self-defense. Our third program Zhandouli-fa Wu-bao Taijiquan draws upon the real life experiences of Dr. Painter as a police trainer and professional bodyguard and Shifu Allan Marshall’s personal knowledge derived from using this art as the basis for their law enforcement training with the American Rangers Law Enforcement Training Institute. The martial program will show you how to discover the hidden combat principles, locks, throws, strikes, kicks and techniques of pressure point control and how to practice them safely with a friend. 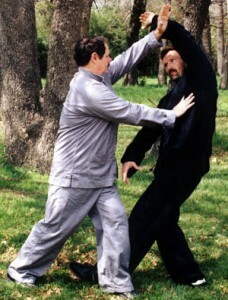 Size does not matter when one understands the principles of Wu-bao Taijiquan. 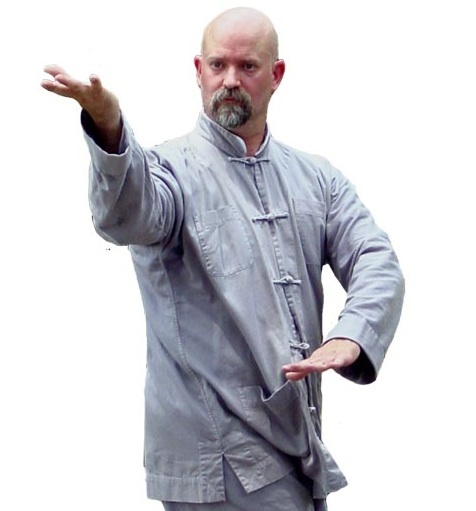 Did you know that some Taijiquan can be dangerous for your joints and even your health? As a consumer you should know that there are many methods of Taijiquan. Different methods are known as styles. 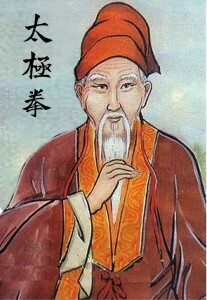 Styles often bear the names of Chinese instructors who created their own methods such as Chen, Yang, Wu and Liu or Li. All of the traditional styles in their original form were quite safe; however over time some of these methods were watered down and changed for various reasons. The most damaging changes occurred in recent times with the addition of modern “sport” Taijiquan performed in tournaments. These changes included widening of stances and changes to movements that while aesthetically pleasing in appearance are in fact often damaging to knees, hips and ankle joints, ligaments and muscles. At the beginning of class students need time to unwind from the day. We use a technique called quiet sitting to do this. Quiet Sitting is just that, sitting down and remaining quiet for a short period of time. The method also uses Qigong (breath work) to develop natural relaxed breathing that improve circulation, calm the nerves and lower blood pressure. 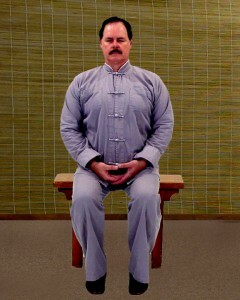 The Gompa method of quiet sitting helps prepare the mind and body for the practice of Taijiquan. Easy motions, such as shoulder circles, turning the head from side to side, or rocking back and forth, help you to loosen your muscles and joints and focus on your breath and body. The Chinese call these pre-exercise movements Daoyin which means to use the mind to lead and guide movements carefully. Daoyin helps improve body awareness and increases nerve transmission from the brain to skeletal muscles. An essential exercise for health and martial skills that is almost lost today is know as power standing or in Chinese Zhan Zhuang (jam jong). The name means standing like a tree or post; however the exercise which seems very simple is actually very powerful. Students are taught to stand holding a series of from one to three different postures while breathing quietly. Through this exercise you come to be aware of how the body holds excess stress and tension in the muscles. The practice of power standing teaches you how to let go of this unnecessary stress and tension which in turn improves joint flexibility, fluidity of movement and reduces stress. Forms are sets of movements strung together like a dance. The Wu- bao Taijiquan form taught at The Gompa is a short form, easy to learn and practice. The name means Five Treasures Grand Ultimate Fist. The form consists of only nine simple actions performed on both right and left sides of the body are all that is needed to develop the health and martial promises of the Taijiquan arts. The short nature of this form makes it ideal for our busy life styles. There are no long 100+ sequences to remember as in other long forms, just five actions that can be repeated in an endless loop providing the ability for short, moderate or long workouts to fit ones personal time schedule. In the first course we focus on health development using the Taijiquan form, however to fully understand the correct usage of the form movements the instructor will perhaps demonstrate the self-defense application of the postures to beginning students. Members of the first program will not study these moves for self-defense, only for understanding the correct positioning of the arms, torso and legs to facilitate correct body mechanics as related to health development. For those choosing to move into the martial art sections this bio- mechanical knowledge learned from long repetition of the forms will be fully engrained by the time you start developing self-defense skills. Another area of concern is the proliferation of unqualified teachers who are allowed to teach by learning from a book, video, or from a weekend teachers course offered by fast buck artists wanting to cash in on the Tai Chi fad. There are no regulations to govern qualification for Taijiquan instructors so knowledge, skill and abilities vary widely. While there are a few exceptions in general most health clubs, gyms and even medical facilities that offer Tai Chi are especially prone to hiring non-qualified teachers or even worse sending one of their aerobic instructors to a Tai Chi weekend workshop and then offering classes. What is a Qualified Taijiquan Instructor? In our view it takes minimum of ten years study to fully learn and understand the intricacies of Chinese concepts utilized in Taijiquan. Teachers must know the writings of the early Chinese masters known as the Taiji Classics; these classics explain the core principles of Taijiquan. The classics are used as the basic foundation for all health and martial exercises found in every method or style. 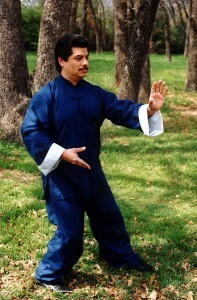 Instructors, even those teachers who focus on health only Taijiquan must understand the martial applications of the forms they teach because the forms are actually pantomimes of combative movements and as such the techniques of each move must be technically correct to impart both the health and martial abilities of the form. Instructors must be familiar with human anatomy, bio-mechanics and physiology as related to the health and safety of the exercises they will be teaching students. Taijiquan taught correctly could be called “medication in motion.” There is growing evidence that this mind-body practice has value in treating or preventing many health problems. You can begin Taijiquan even if you aren’t in top shape or the best of health. Beginners learn Taijiquan as a low- impact, slow-motion exercise. Taijiquan differs from other types of exercise in several respects. The circular continuous movements are performed slowly at first and never forced, the muscles are relaxed rather than tensed, joints are not fully extended or bent, and connective tissues are not stretched. Taijiquan can be easily adapted for almost anyone, from the very fit to people confined to wheelchairs or recovering from surgery. “A growing body of medical and scientific research is building a compelling case for Taijiquan as an adjunct to standard medical treatment for the prevention and rehabilitation of many conditions commonly associated with age,” says Peter M. Wayne, assistant professor of medicine at Harvard Medical School and director of the Taijiquan and Mind-Body Research Program at Harvard Medical School’s Osher Research Center. An adjunct therapy is one that’s used together with primary medical treatments, either to address a disease itself or its primary symptoms, or, more generally, to improve a patient’s functioning and quality of life. Taijiquan basic forms for beginners are slow, gentle, and do not leave you breathless. Taijiquan practice addresses a key components of fitness — muscle strength, flexibility, balance, and, to a lesser degree, aerobic conditioning. In a 2006 study published in Alternative Therapies in Health and Medicine, Stanford University researchers reported benefits of Taijiquan in 39 women and men, average age 66, with below- average fitness and at least one cardiovascular risk factor. 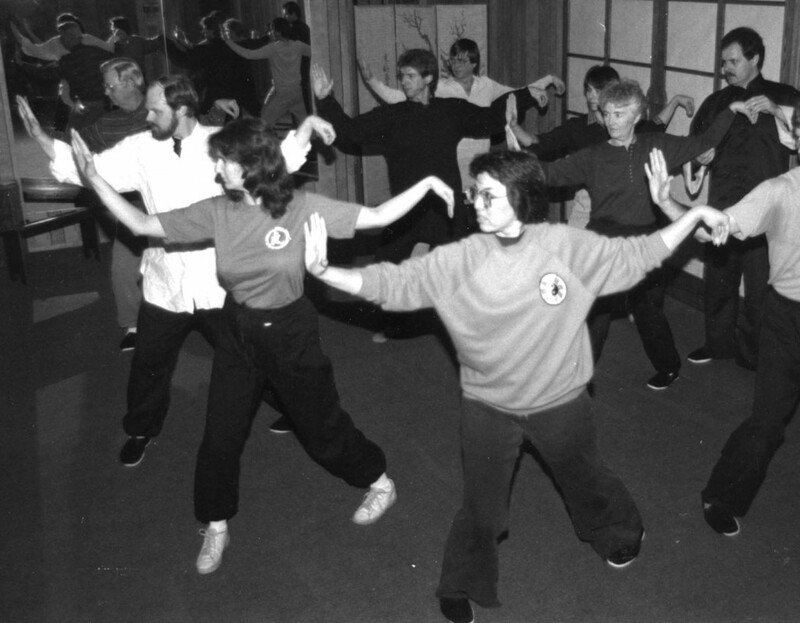 After taking 36 Taijiquan classes in 12 weeks, they showed improvement in both lower-body strength (measured by the number of times they could rise from a chair in 30 seconds) and upper-body strength (measured by their ability to do arm curls). In a Japanese study using the same strength measures, 113 older adults were assigned to different 12-week exercise programs, including Taijiquan, brisk walking, and resistance training. People who did Taijiquan improved more than 30% in lower-body strength and 25% in arm strength — almost as much as those who participated in resistance training, and more than those assigned to brisk walking. Taijiquan improves balance and, according to some studies, reduces falls. Proprioception — the ability to sense the position of one’s body in space — declines with age. Taijiquan helps train this sense, which is a function of sensory neurons in the inner ear and stretch receptors in the muscles and ligaments. Taijiquan also improves muscle strength and flexibility, which makes it easier to recover from a stumble. Fear of falling can make you more likely to fall; some studies have found that Taijiquan training helps reduce that fear. Depending on the speed and size of the movements, Taijiquan can provide some aerobic benefits. One study showed that because Taijiquan footwork stimulates what are know as the plantar fascia foot pumps Taijiquan does improve vascular blood flow in the lower extremities resulting in a higher rater of oxygen being transported through the blood system. Those who want a more aerobic effect can simply perform the forms at a faster rate with deeper stances. 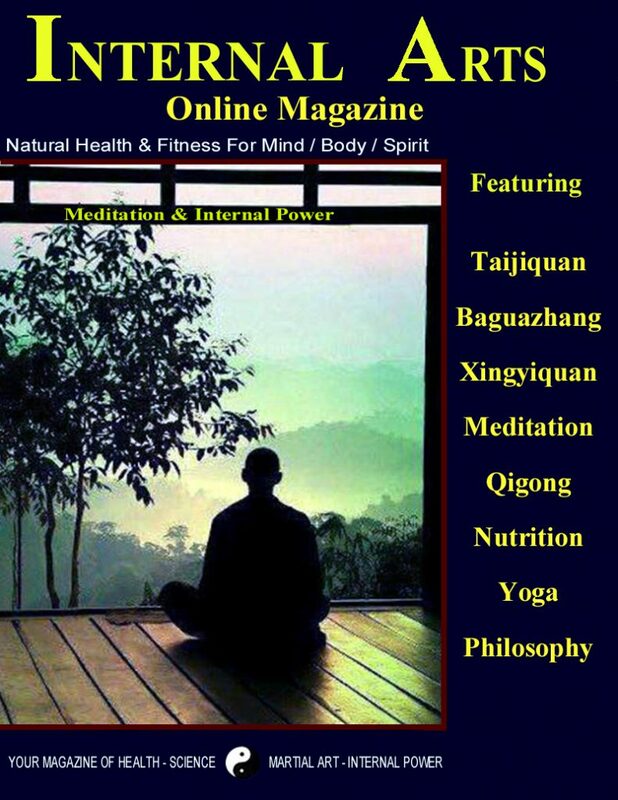 Can You Learn Taijiquan On-Line? Books and videos or DVD programs that purport to teach Taijiquan on line or from a distance have flooded the market place in recent years. There is value in using these products as guides to help remind the student of lessons received in person from a real teacher. As far as actually learning the arts of Taijiquan correctly without a teacher it is highly unlikely that any real progress can be made in this way. There are just too many factors, principles and concepts that need to be imparted through human touch. There are many styles and variations of Taijiquan and many interpretations within these styles by individual teachers. If one does not know about the styles of Taijiquan progress could be difficult if not impossible. Also some modern Taijiquan forms are actually damaging to the knees due to changes made for the sake of aesthetic appearance or teachers who modified the forms or who may not understand correct posture or bio-mechanics. This poor understanding comes from a number of factors some of which include the teacher being self-taught and since there is no certification for Taijiquan instructors, anyone can try to learn from a book or video and claim to be an instructor. Even those who have learned from a Chinese teacher may not understand correct bio-mechanics because the teacher does not know anatomy and so the instructor may simply pass on so called ancient information that may in fact be damaging to the hips and knee structure especially in older individuals and this misinformation ends up in their books and videos. Just because the Taijiquan teacher on a video or in a book is teaching Taijiquan at a hospital or health spa does not actually qualify him or her as an expert. Western medical facilities and doctors are no better than the general public when it comes to Chinese arts as far as they are concerned if it says Taijiquan on the business card then you must be an expert. 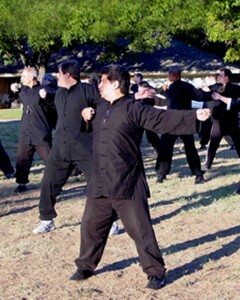 The instructors at The Gompa in Arlington Texas have 30+ years experience with traditional Taijiquan and they are required to be familiar with bio-mechanics, and sports medicine concepts. Each of our teachers’ forms is carefully examined to make sure all postures and movements are correct and within the safety limits of the human muscle and skeletal structures. In a 40-person study at Tufts University, presented in October 2008 at a meeting of the American College of Rheumatology, an hour of Taijiquan twice a week for 12 weeks reduced pain and improved mood and physical functioning more than standard stretching exercises in people with severe knee osteoarthritis. According to a Korean study published in December 2008 in Evidence- based Complementary and Alternative Medicine, eight weeks of Taijiquan classes followed by eight weeks of home practice significantly improved flexibility and slowed the disease process in patients with ankylosing spondylitis, a painful and debilitating inflammatory form of arthritis that affects the spine. A review of six controlled studies by Dr. Wayne and other Harvard researchers indicates that Taijiquan may be a safe and effective way to maintain bone density in postmenopausal women. A controlled study of Taijiquan in women with osteopenia (diminished bone density not as severe as osteoporosis) is under way at the Osher Research Center and Boston’s Beth Israel Deaconess Medical Center. Taijiquan has shown potential for improving quality of life and functional capacity (the physical ability to carry out normal daily activities, such as work or exercise) in women suffering from breast cancer or the side effects of breast cancer treatment. For example, a 2008 study at the University of Rochester, published in Medicine and Sport Science, found that quality of life and functional capacity (including aerobic capacity, muscular strength, and flexibility) improved in women with breast cancer who did 12 weeks of Taijiquan, while declining in a control group that received only supportive therapy. published in the September 2008 Journal of Alternative and Complementary Medicine, found no improvement in a control group that did not practice Taijiquan. In a 30-person pilot study at Harvard Medical School, 12 weeks of Taijiquan improved participants’ ability to walk and quality of life. It also reduced blood levels of B-type natriuretic protein, an indicator of heart failure. A 150-patient controlled trial is under way. In a review of 26 studies in English or Chinese published in Preventive Cardiology (Spring 2008), Dr. Yeh reported that in 85% of trials, Taijiquan lowered blood pressure — with improvements ranging from 3 to 32 mm Hg in systolic pressure and from 2 to 18 mm Hg in diastolic pressure. Parkinson’s disease. A 33-person pilot study from Washington University School of Medicine in St. Louis, published in Gait and Posture (October 2008), found that people with mild to moderately severe Parkinson’s disease showed improved balance, walking ability, and overall well-being after 20 Taijiquan sessions. In a University of California, Los Angeles, study of 112 healthy older adults with moderate sleep complaints, 16 weeks of Taijiquan improved the quality and duration of sleep significantly more than standard sleep education. The study was published in the July 2008 issue of the journal Sleep. In 136 patients who’d had a stroke at least six months earlier, 12 weeks of Taijiquan improved standing balance more than a general exercise program that entailed breathing, stretching, and mobilizing muscles and joints involved in sitting and walking. Findings were published in the January 2009 issue of Neuro-rehabilitation and Neural Repair. Fibromyalgia (FM) is one of the most common musculoskeletal disorders and is associated with high levels of impaired health and painful symptoms that frequently flair up without relief. The cause of FM is unknown, and there is no known cure. In a study of 39 subjects with FM who practiced Taijiquan twice weekly for six weeks (one-hour classes), it was found that FM symptoms and health- related quality of life improved after the study. This could be good news for many other individuals who suffer from this disorder. There is much debate as to the true origins of Taijiquan; however most scholars agree that despite mythological legends attributing the founding of the art to mythical Daoist Zhan San-Feng Taijiquan was actually created by Chinese general Chen, Wangting (1600-1680) a warrior, a scholar, and a ninth generation ancestor of the Chen family invented Taijiquan after a lifetime of researching and developing skills in Chinese martial arts. Chen, Wangting served the Ming Dynasty in times of war. In his old age, Chen, Wangting retired and created a health and martial art based on his own war experiences and knowledge of various martial arts styles. 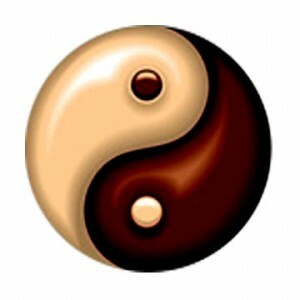 In his creation of Taijiquan, Chen, Wangting combined the study of Yi Jing, (Book of Changes), Chinese medicine, Daoist theories of yin and yang expressed in Taijiquan as the hardness vs. the softness, the substantial vs. the insubstantial, etc, the five elements (metal, wood, water, fire, earth), the study and methods of Daoyin (channeling and leading internal energy) and Tuna AKA Qigong (deep breathing exercises). Today there are many variations and off shoots of Taijiquan. Most of the styles bear the names of the masters who modified the original Chen style or who created their own versions. Some of the names of the styles are Chen style, Wu style, Hao style, Sun style, Quang-ping style, and others. Another lesser known category of Chinese martial artists is that of the family style AKA farmer styles. These are closed or secret styles (mi-zong). Family styles were martial arts or health exercises practiced within a particular clan of blood related families or secret societies. Such styles were methods developed by a martial arts master from existing methods or newly created concepts learned from observing nature or studying strategy. Martial evolution continues as new teachers add to or break away from traditional methods forming new arts and systems some become family styles while others remain open to the general population. Those like intension fist boxing (yiquan) are shared with the world while others are kept under wraps and jealously guarded by a privileged few. Martial art historians estimate that due to the lack or written documents or the total extinction of a particular clan literally hundreds perhaps thousands of such family or secret styles both internal and external have come into and gone out of existence during the last five hundred years in China. The Li family masters created their own family style of Taijiquan. They distilled the essence of the original Chen and Yang Taijiquan styles blending them with concepts already practiced in their family arts into a method containing nine moves. 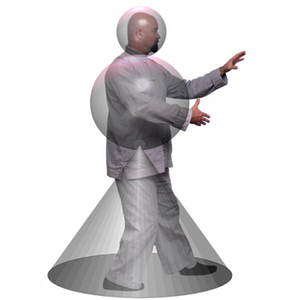 At its core there are five movements derived from the Taijiquan classic forms. They named it the Five Treasures Grand Ultimate Fist / Wu-bao Taijiquan this is a unique style of Taijiquan created by the Li family of Sichuan province China. It is based on the founding principles of the Taijiquan Classics written by the creators of the art. There are four opening movements and five core movements; Void standing, ward off, roll back, press and push. After performing the three opening movements the five core moves are performed on both right and left sides of the body so one exercises the methods in an ambidextrous way. These moves provide all of the health and martial benefits that any style of Taijiquan has to offer. These nine moves are all that is needed to develop the health and martial promises of the Taijiquan arts. John Painter began training in the Li family styles of Baguazhang, Taijiquan, Xingyiquan, Daoist Qigong Yoga and weapons in 1957. Painter studied with his Shifu Li, Long-dao until shortly after 1969 when he was provided with a letter of lineage naming him the inheritor of the Li family style in North America. During the 1980’s Dr Painter studied Tibetan Meditation and the Yantra method of Nyida Khajor Tibetan Yoga through the venerable Trangu Rinpoche and other Tibetan Lamas. Painter holds a Ph.D. in Chinese Naturopathic medicine He has been teaching Chinese internal martial arts and Qigong around the world for over 35 years. Dr. Painter is the chief instructor at the Gompa Center in Arlington Texas, the oldest Chinese martial arts school in Texas. He also oversees a network of branch schools throughout the United States, Great Britain, Germany, Israel and Canada. 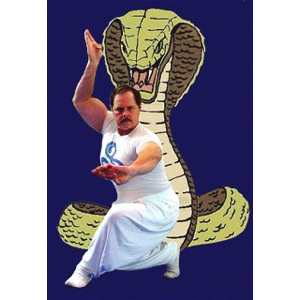 Dr. Painter was elected to the Inside Kung Fu Hall of Fame, The Texas Martial Arts Hall of Fame and was named as one of the most sought after Chinese martial arts seminar instructors in America by Inside Karate and Black Belt magazines. Mr. Castaldo has been studying with Dr. Painter since 1978. He is proficient in Taijiquan and Xingyiquan. 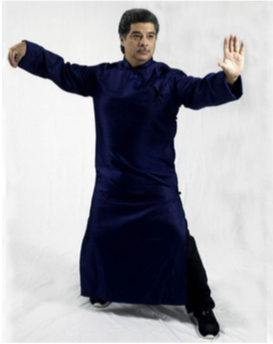 His Daoqiquan specialty is Jiulong Baguazhang martial and Qigong principles. In October of 2004 after rigorous mental and physical testing, he was promoted to the level of Shifu (instructor) of Jiulong Baguazhang in a ceremony held at the annual Founders Day Celebration. Shifu Castaldo oversees the Jiulong Baguazhang program at The Gompa and worked closely with Dr. Painter to develop the new Dragon Rolling the Pearl curriculum. He is also a sergeant in the American Rangers Law Enforcement Martial Training Institute specializing in hand to hand combat and pistol methods. Mr. Castaldo has also been a senior lecturer at the University of Texas at Arlington. He is also involved in feature motion picture production serving as director, editor and screenwriter on a number of films. Mr. Marshall has been with Dr. Painter since the winter of 1981. His specialties are in Taijiquan, Xingyiquan and Jiulong Baguazhang. In October of 2000 he was promoted to the level of Shifu (instructor) of Taijiquan, Baguazhang and Xingyiquan in formal ceremonies held at The Gompa. He is a Lieutenant in the American Rangers Martial Law Enforcement Training Institute specializing in hand to hand combat and folding knife, weapons retention, PKC pistol and baton tactics. 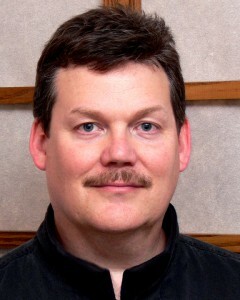 Shifu Marshall teaches Xingyiquan and weapons programs at The Gompa and at a local health club, The Maverick Center. Beginners can train in warm up suits or jeans and T shirt for the first month after this we prefer that our students wear the traditional black Han Zhifu for classes. 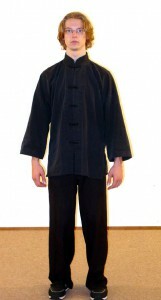 A Han Zhifu is a training uniform known to many as Chinese martial arts uniform or Kung Fu clothing. It is really the standard clothing worn by Chinese people during the Han Dynasty 206 B.C.–220 AD so Han Zhifu means Han uniform. A traditional Han zhifu is a pajama like uniform consisting of pants and jacket with a mandarin collar. Traditional old school zhifu were of plain cotton or other natural materials and were colored, grey, black, white or blue (we prefer the black for all beginning students). A white or black undershirt either long or short sleeved devoid of pictures or slogans is worn beneath the jacket. Soft cotton sole cloth shoes rounded out the traditional uniform. Today our students are allowed to wear leather or canvas walking shoes, sneakers or deck shoes with rubber soles.